Heidi from Fabric Mutt shares a tutorial at The Glamorous Housewife showing how to make her Constance Organizer. The outside resembles a book with a fabric cover and a contrast spine. 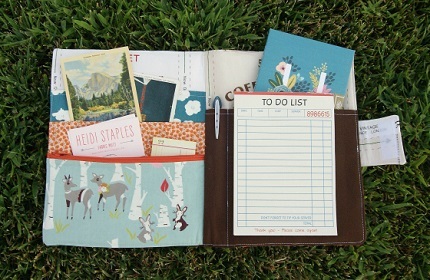 On the inside, plenty of pockets will hold notepads, pens, business cards, and other bits to keep you organized. One of the pockets is has a zipper across the top in case you have smaller items that need to stay put. Go to The Glamorous Housewife to find her tutorial.